I just returned from a trip to New Orleans where my dh happily let me visit four different quilt shops. What fun! I bought some cute Cajun cooking fabric that I would like to use in a topper or runner. I also bought some black and white fabric with forks on it. I am looking for a FREE pattern to use these two fabrics with. I have searched the Internet but kept ending up on dead ends. Then, a light bulb went off! This board is the best resource so now I'm asking my QB buddies to share some of your links with me. I hope you get some ideas. I'm sure someone will be able to help you. I only make quilts. I was just in New Orleans and only saw one quilt shop. Hmmmm. But my daughter and I really enjoyed taking a cooking class, food, plantations, food, gators, food. It was a wonderful trip. We went to the Quilted Owl and Mes Amis in NOLA. We drove across Lake Ponchatrain to Sew This in Abita Springs; the 23 mile bridge was something to cross over! We were actually going to the Abita Brewery but since we were there anyway...... Then, we drove to Lola Pink in Lafayette after a trip to the Tabasco plant. We took a cooking class,too. I just weighed and I gained 4.5 pounds. Ouch! Just saw this one on pinterest. Would this work? It's always helpful if you show us the fabric ... and then ideas usually overflow here on the QB. .... though it often goes into overdrive, once it knows what fabric it must use! Last edited by QuiltE; 06-12-2013 at 06:59 AM. 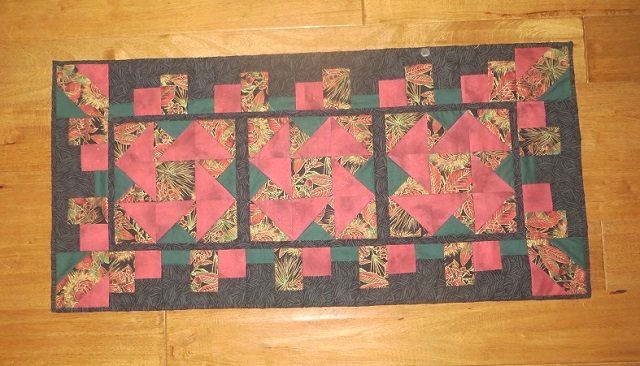 What kind of pattern are you looking for pieced, appliqué, paper pieced etc.? There are some great octagon table toppers shown on QB. There are more difficult ones like the Star Spin topper, Spicy Spiral runner, French Braid etc. if you decide this is the one you want to make, read the entire thread as for the first time of all her mysteries there were a number of mistakes in her process which she did correct. Last edited by marymm; 06-12-2013 at 04:28 PM.